Edit: The voting period is now over, check out the results below and join us next week for the next step in our samurai's journey! 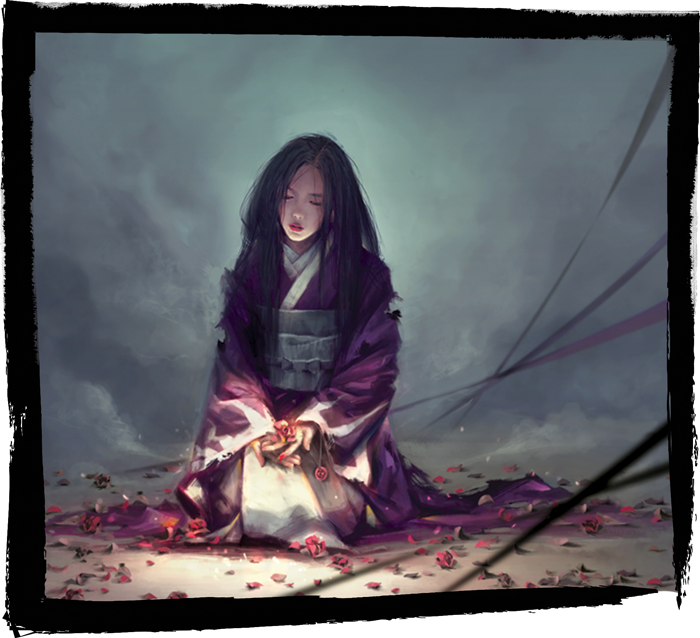 Welcome to our second article that sees you, the Legend of the Five Rings: The Card Game community, designing your very own samurai in the world of Rokugan! 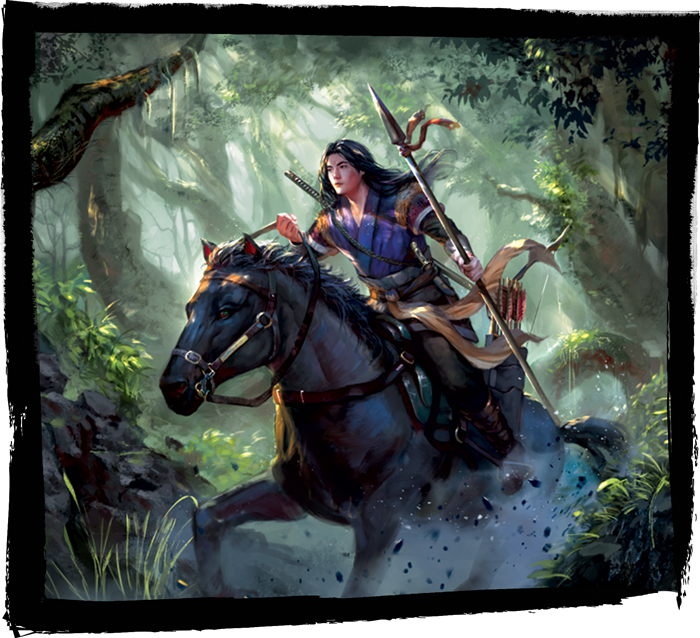 Every week, the community will vote on various aspects of a new Legend of the Five Rings: The Card Game character that will appear in a future expansion! While the final version of the card is subject to changes during playtesting, the heart and soul of the character will be defined by you. 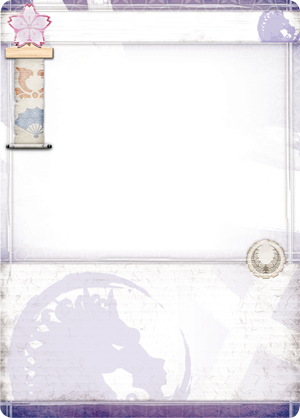 Last week, samurai of Rokugan determined what Great Clan our character would belong to. Over 3,000 votes were tallied, and the race was incredibly tight. The Lion secured the third highest number of votes with 416, the Crane took second with 500, but the Unicorn emerged victorious with 548 votes! We now know what Great Clan our samurai represents, but from which family does our samurai hail? 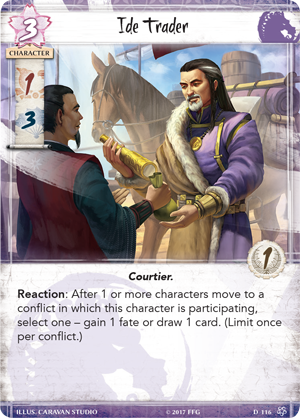 The Moto, Ide, Iuchi, Shinjo and Utaku families all fulfill important roles for the clan that rides, and the family of our samurai will tell us a great deal about their role in the karmic balance of the Emerald Empire. Read on for a run-down of each of the Unicorn families, and vote at the bottom of the article! The poll will remain open for 24 hours, so make sure your voice is heard! What fate awaits our Unicorn Clan samurai? 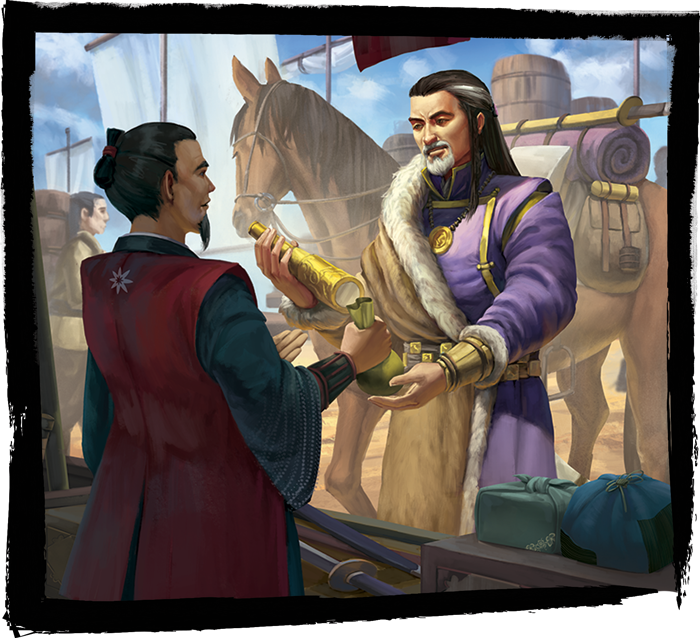 The Ide serve tirelessly as diplomats, couriers, and merchants across Rokugan. While they are Unicorn through and through, the Ide have learned to blend their foreign customs with the traditions of the Empire to better treat with their cousins. The Ide work to radiate calm and competence, seeking to build alliances and friendships throughout the Empire. 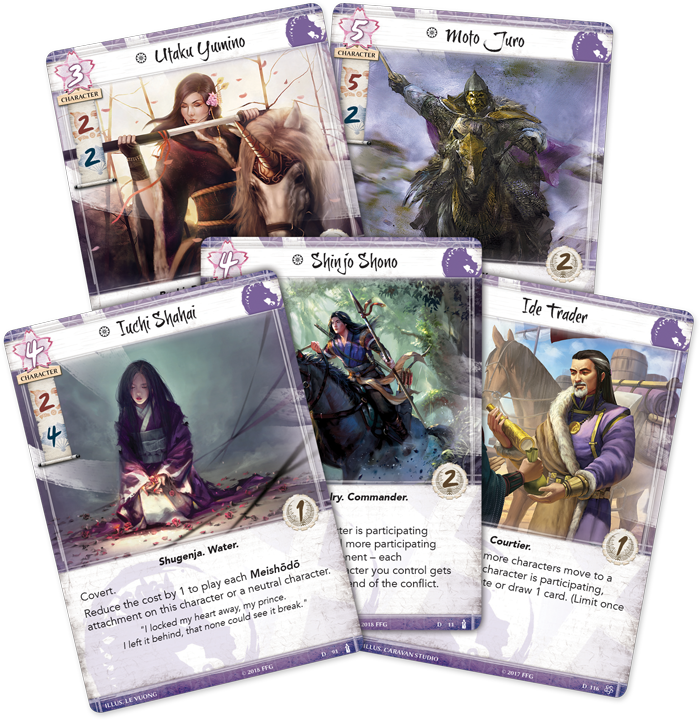 The Ide family serve as representatives of the Unicorn Clan to the rest of Rokugan. Cards like Ide Trader (Core Set, 116) enhance your standing in conflicts by providing additional resources. Is this the path the Legend of the Five Rings community will choose? The Iuchi are a priestly family, whose practices stretch back to the time before the Unicorn returned to Rokugan. Iuchi shugenja practice a unique form of sorcery known as meishōdō, the art of using talismans and names to manipulate the spirits. Their history makes them more open to exploring different mystical paths than those shugenja bound by centuries of tradition. The Iuchi family serve as the Unicorn’s unique form of shugenja, harnessing powerful meishōdō magic to defeat their foes. 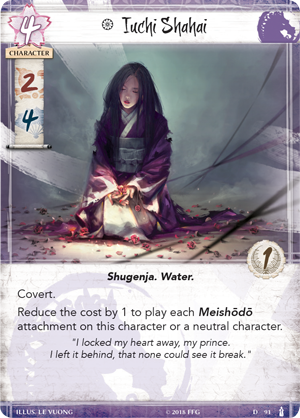 Characters like Iuchi Shahai (All and Nothing, 91) can provide a discount on these spells, but not every Iuchi relies solely on being a Shugenja. 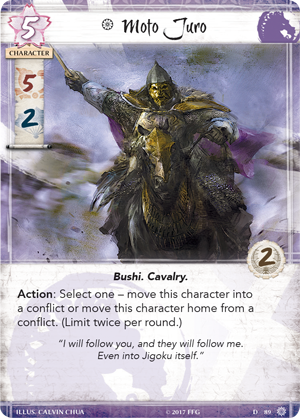 The Iuchi Wayfinder (Core Set, 190) scouts unknown lands, preparing you for the conflicts to come. Does our samurai come from this most mystical family? The Moto are considered to be the least civilized of the Unicorn families by the standards of the Empire. From their stocky builds and the heavy beards of their men, to their style of dress, the Moto seem foreign and strange to Rokugani samurai. Indeed, the Moto have no use for the soft trappings of what some call civilization; they are nomadic warriors seeking the next battle, and they embrace that harsh life. While their heritage and culture are often questioned in Rokugan, their bravery is not. The Moto are brave and fierce warriors who use their steeds to gain the advantage in conflicts. Characters like Moto Juro (Fate Has No Secrets, 89) can leave or enter conflicts at will, giving the Unicorn the reinforcements they need to claim victory. Will our samurai ride with the warriors of the Moto? The Shinjo are the core of the Unicorn, the clan of explorers who followed their kami, Shinjo, into the dangerous world beyond the Empire. This love of discovery has not left the Shinjo, and they travel widely when they can. They administrate and lead the Unicorn, working to keep all of the parts of the clan yoked together. 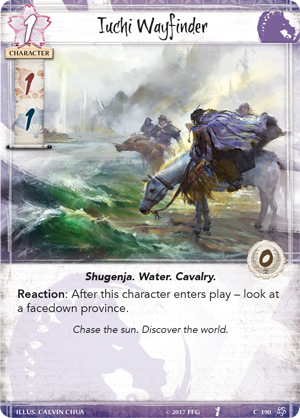 Master equestrians and scouts, the Shinjo pursue peace, but never flinch from the prospect of war. The Shinjo elevate each other part of the Unicorn, and are the heart of the clan. 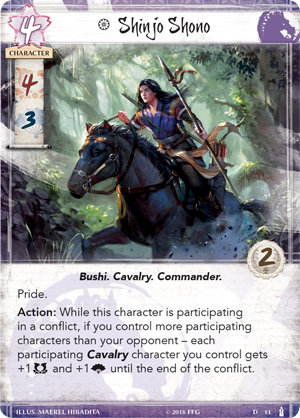 Characters like Shinjo Shono (Breath of the Kami, 11) can boost all your Cavalry characters and unite them to lead the Unicorn to victory. Will our samurai find their place among the Shinjo? 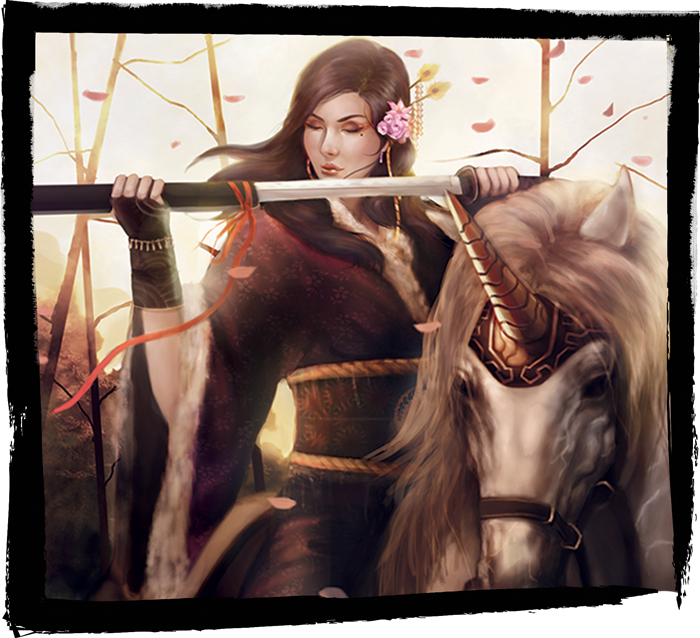 No other Unicorn family has so deeply and spiritually embraced Bushidō as the Utaku, who embody it in their elite Battle Maidens, the Shiotome. The matriarchal Utaku allow only their women to ride to war; the Utaku men serve afoot as infantry and in the stables and households, making them unusual among their own clan. 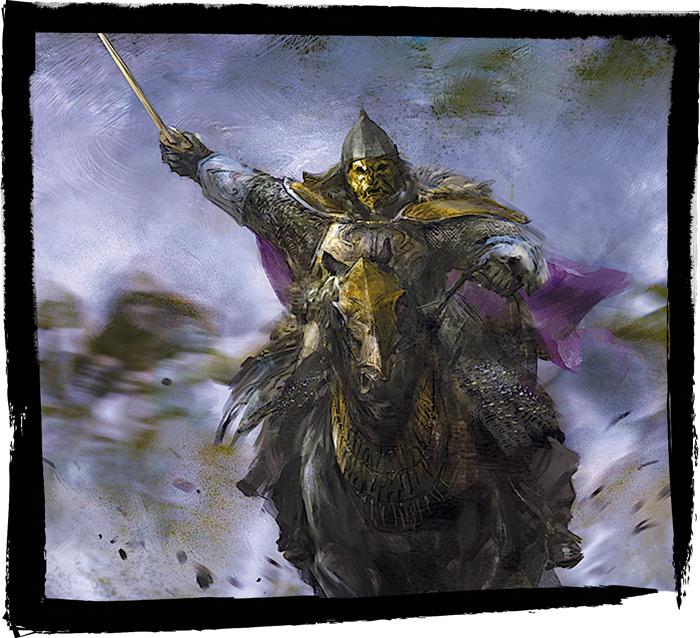 There is no finer heavy cavalry in the Empire than the Battle Maidens, and no finer equerries than Utaku men. The Unicorn’s Battle Maidens define the Utaku. Elite warriors who ride down and defeat their opponents, few forces are more feared. 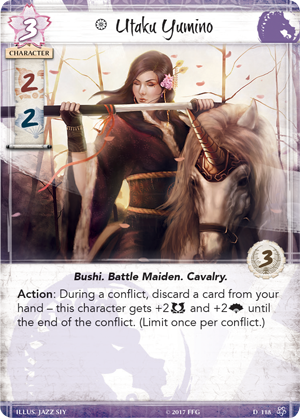 Cards like Utaku Yumino (Core Set, 118) have easy ways to boost your skill in any conflict, and are always willing to ride into battle. 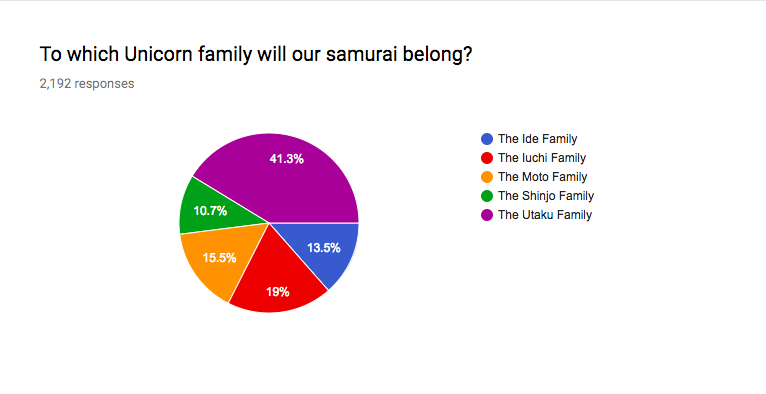 Will the Utaku become the family for our samurai? Once you’ve considered the options, vote below. The poll will remain open for 24 hours, so make sure your voice is heard! From the battle maidens of the Utaku to the negotiators of the Ide, the Unicorn families each fulfill an important role for the clan. While this choice will not lock in any mechanical aspects of the character, it will inform their personality, culture, and history. Which family does our samurai belong to? Remember to vote within the next 24 hours and join us next week as we begin to tackle the mechanical aspects of our samurai!